Brief History of Political Advertising in the U.S. Anyone who has been in the United States during the run-up to a presidential election will know all about political advertising. To say it bombards TV viewers, radio listeners, internet users, and anyone who sees a billboard would be a vast understatement. The amount of money spent on political advertising grows every year, with an estimated $9.8 billion spent in the 2016 election year. It was the dawn of television that changed the way politicians reached their audiences. Before that, it was all about getting out and about, meeting the voters, holding town-hall debates and shaking hands. In fact, in 1948 Harry S. Truman covered over 31,000 miles in America, shaking over half a million hands. That was quite the achievement back then, but it would be astonishing today. No candidate would ever put that kind of a commitment into the meet-and-greet when advertising can do a far more effective job. Presidential candidate Dwight D. Eisenhower was the first politician to really take advantage of TV, creating more than three dozen 20-second television spots. They were filmed in one day at Radio City Music Hall, where visitors asked questions that were were spliced into separate shots of Eisenhower answering them (as though the viewers were asking him directly) in his trademarked "no bull" way. These questions were split into ads, and the campaign "Eisenhower Answers America" ran. The campaign was credited with helping Eisenhower win the election. After Eisenhower, the power of television could not be doubted. Nixon's television addresses during his presidential campaign, covering the Cold War and government corruption, were very powerful. However, John F. Kennedy was a man who was born to be on camera and created more than 200 television ads in his run for the White House. Their televised debate is seen as a watershed in political campaigning. While Kennedy was at ease on camera, looking slick and confident, Nixon was fidgety on camera, had sweat on his brow and looked troubled. Ironically, when the debates were televised, people thought Kennedy was the clear winner, while those listening on the radio thought the opposite. Lyndon B. Johnson ran one of the most controversial ads in political advertising history. Entitled "The Daisy Girl," it showed a young girl playing "he loves me, he loves me not" and when she plucked the last petal, a voice counted down to a nuclear explosion. The tagline "because the stakes are too high for you to stay at home" is believed to have sealed Johnson's victory over opponent Barry Goldwater. In the decades that followed, and up to the present day, more political campaigns have "gone negative." And even though voters claim not to like attack ads, statistics show these ads are effective. It's fair to say that Bill Clinton was the first presidential candidate to effectively use more of the non-traditional forms of a political ad. Rather than run a campaign comprised solely of TV spots, radio ads, and billboards, he spread his reach much wider. He would appear on daytime TV talk shows and find his way onto channels like MTV. This grabbed the attention of younger voters. But when it comes to modern political advertising, Barack Obama changed the game. Although he used traditional media outlets and ran some negative spots, his campaign was based on a positive message: hope. And, he used the internet and guerrilla advertising successfully. Artist Shepard Fairey created an iconic poster that was seen across America. Obama's use of modern methods, plus his youth and charm, upstaged his much older, traditional Republican opponent, John McCain. 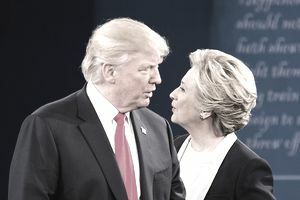 In what many considered a surprising result, candidate Donald Trump was successful in defeating Hillary Clinton to win the 2016 presidential election. One thing is for certain: 2016 was a game-changer with President Trump's caustic rhetoric giving his campaign millions of dollars in earned media without spending a dime. And for better or worse, Trump's use of Twitter as a means of reaching voters proved effective.